Alright y’all, the day has come. The Nordstrom Anniversary Sale is officially open to the public (yay!!) so now everyone can get their hands on these awesome deals for fall. I’m not going to beat the whole #NSALE thing to death, however I wouldn’t be a real blogger without mentioning it because hello… I love to shop! Today I’m taking you through some of my top picks that won’t break the bank- they’re all under $100. I’ll be sharing a few of the things I got, sent back, and what’s on my wish list. Happy shopping, y’all! If there was one staple piece to get for the fall, this is it. This top is back by popular demand and is loose, flowy, and long enough to be worn with leggings. It’s no secret that I’m a huge fan of Kendra Scott jewelry and what better time to scoop up some new pieces? I love these thin cuffs- lightweight and perfect for stacking! I’m not currently in the market for a watch but… this one definitely caught my eye. How fun is that floral print and the black and gold face? It also has a date function and is affordable. Swoon! SUCH a cute faux leather jacket! I ordered the black one and wanted to love it, however I had the same problem I always have with jackets- the sleeves were a bit too long. But don’t let that deter you, I’m just petite and have super short arms. Ugh. But this jacket though… so pretty! The glittery studs are back, but this time in a more petite version. These would make a great gift for a girlfriend or fun stocking stuffer. For $20 you just can’t beat it! 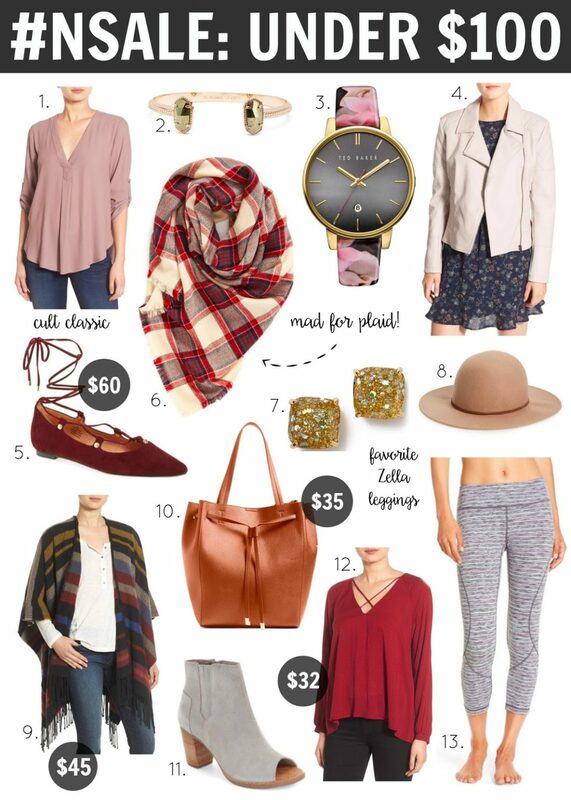 Last fall I fully embraced the floppy hat trend and am looking to add a brown hat to my collection. They’re perfect for those bad hair days, am I right? I love love love the colors of this poncho! However, the “one-size-fits-all” element always scares me a little bit (remember, short girl problems) so this might be something I’d need to try on in store. It would be the perfect layering piece with a tee and some riding boots. I love a good designer handbag, but sometimes it’s nice to find more affordable alternatives. I love the shape of this bag and that cognac color is so pretty. At $35, it’s such a steal! If you get one shoe for fall, get a bootie. TOMS are known for their comfort which is super important for this girl. I have my eye on these and love the peep toe. The “x-front” and lace-up trend is everywhere this season. I really liked this top (ordered it in the cabernet color) but once again… the sleeves!! Super soft material and flattering neckline- I’d definitely scoop this one up. We all know Zella workout gear is the bomb. I got these leggings in the blue/green color and they do not disappoint. I know I can always count on this brand for great quality clothing that is comfortable and stylish. I just love those blanket scarves!! The colors are all gorgeous! Can't beat these deals! I'm dying for those Kate Spade studs. And that scarf is perfect for fall!